Writers are conflicted creatures, forced to negotiate between being true to their work, and turning a profit. For most of their careers they view success as selling out, and many of them feel that commercial viability somehow denigrates their art. They spend their lives writing things that no one reads, and for the most part, they never receive any sort of recognition. This makes them view success as a form of failure, because if it’s not, their work can’t be as good as they think it is. David Foster Wallace found success with his book Infinite Jest, and his writerly life of solitude, analysis, and atomisation from society changed irrevocably. All at once he was famous, the type of famous that makes money, that’s marketable, and worst of all, turns a writer into a celebrity. For Wallace, selling his work cost him his sense of self. His writing was no longer just his, and although his success validated his career and path as a writer, it altered him as an individual. James Ponsoldt explores the complexity of David Foster Wallace in the film The End of the Tour. He frames his discussion of Wallace’s career through a moment in time right before the wave of fame and celebrity came crashing down. Shortly after his book was published in 1996, Wallace agreed to do an interview with Rolling Stone Magazine, and David Lipsky, himself an author, headed out to meet Wallace at his home. Wallace was just about to embark on his book tour, and Lipsky shadowed him, recording erudite conversations along the way. Jesse Eisenberg as David Lipsky. The film takes the form of an extended conversation, and there are few scenes that occur in silence, as both men vie for the centre of attention, and conversely feel ashamed of their egocentric motives. What’s most interesting about the film is the fact that Lipsky stands in for a pre-fame version of Wallace, and he views his contemporary with a degree of envy. Wallace on the other hand bemoans the fame that’s accompanied his latest literary project. There’s a sense of sadness throughout The End of the Tour, as the narrative takes place in retrospect. The film opens in 2008 with the news that David Foster Wallace committed suicide, and David Lipsky revisits the time he spent with Wallace by listening to the tapes he compiled. It lends the narrative a sense of prolepsis, and the conversations that follow are laden with subtext. There are moments where Wallace discusses suicide, and his path through life is shown to be troubled, and beset by self doubt. But Lipsky isn’t that different, and both men reflect each other, sometimes in touching moments of shared poignancy, and at other times with a similar sort of arrogant ugliness. Jason Segel as David Foster Wallace. 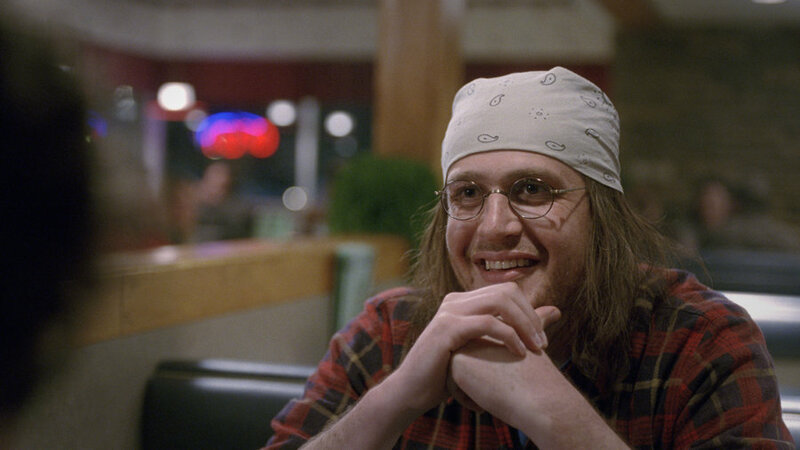 Jason Segel plays David Foster Wallace. He’s restrained, and his discussions on art, verisimilitude, and honest expression, ring true for acting, as well as writing. It seems that Segel mines some of his own experiences, the troubled years before making it, to lend his portrayal of Wallace authenticity. A Marc Maron podcast with Jason Segel. They discuss fame, and the difficulties in achieving it. 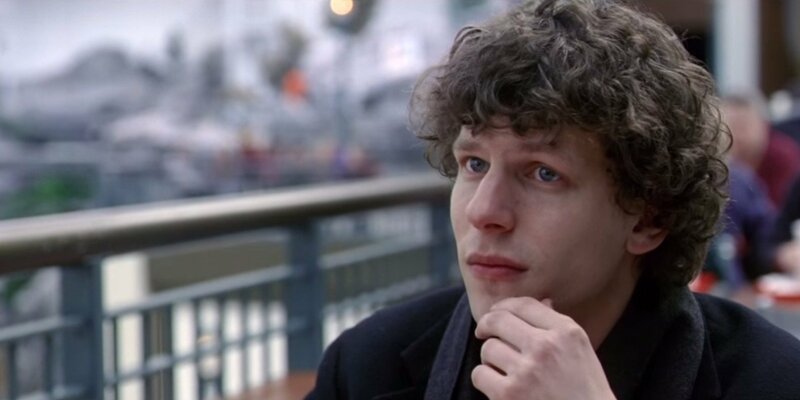 David Lipsky, played by Jesse Eisenberg, seems more pretentious than Wallace does. He uses longer words, he’s an academic, and he stands in contrast to Wallace’s everyman. Together though Eisenberg and Segel breathe life and charisma into what’s ostensibly one long conversation with their strong character driven performances. There’s a certain irony in watching a film about David Foster Wallace, a man who claimed TV, and mass media in general, to be addictive and dangerous. Although he shunned pop culture, Infinite Jest became a defining moment within it. And now there’s a film, starring an actor made famous on a TV sit com, about him. Wallace’s fear of commercialisation is now commodified and sold through the very medium he feared. But, for me, the beauty in biographical film lies in the fact that we can resurrect ghosts from the past, if only briefly. And even though they’re poor facsimiles for their real world counterparts, a good story let’s us see the world through their eyes, and however illusory, experience what they did. David Foster Wallace is a part of our collective legacy, and his work has a lasting impact. The End of the Tour isn’t a film for Wallace – it’s for his fans, it’s for the people who read his work, and it speaks of the lasting impact of his writing. The End of the Tour closes on a touching note. Lipsky provides a voice over as the film cuts to a scene where Wallace is dancing. He’s spinning in a circle, his arms reaching upwards, with his face split in two by a wide grin. In many ways the image succinctly defines the entire film. Wallace was a man who danced to his own tune, he saw the world uniquely, and he was full of life once too. It’s the only truly filmic moment in Ponsoldt’s biopic, but it’s a fitting one. That’s where we leave David Foster Wallace, in a moment of infinite jest, captured on film, forever alive.